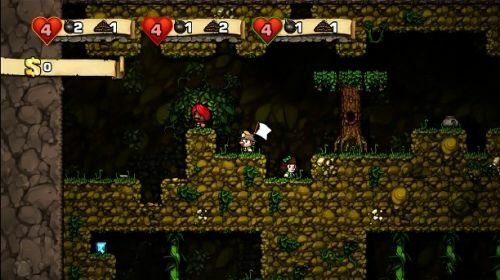 Last week my wife and I sat down with a freshly downloaded copy of Spelunky. We were anticipating some fun, randomly generated, 2D platforming from the XBLA. I quickly gave her the background of the game, explaining that it was a revamped indie title which has been around for almost four years. It was even available on the PC for free. I also made the mistake of mentioning it was heavily influenced by the notoriously difficult Spelunker. She assisted me in the Spelunker HD Co-Op Review, and that was... an experience. As I was explaining all of this she started making a face similar to the one you're probably making right now, and told me, "Enough of the history lesson, let's play the game." We signed into our Gold accounts (which are NOT required for co-op), watched the short opening cinematic, and proceeded to select our characters. We were then presented with this message: "Multiplayer progress is not saved. Your scores will also not post to the leaderboards." Well. Crap. Not a good start. Nothing kills a co-op mood more than being told our progress won't matter. We begrudgingly spelunked on. Player one gets a white flag, which indicates who the camera will follow. We entered the first area, the Mines, armed with whips, two bombs, two ropes, and four hit points each. We could kill the menacing creatures with our whips, or by throwing just about any object at them (including the bodies of other defeated foes). Most bad guys could also be stomped on, Mario style. Our limited supply of bombs opened up new pathways and obliterated traps. We learned to use our ropes to lower ourselves off ledges and to climb out of pits. After we got used to the controls is was time to do some serious looting. Treasures littered the entire area. We promptly had our 2D butts handed to us. Then we died again. And again. And again. We would occasionally make it through a level, each one marked with a 1-1, 1-2, etc. But Spelunky is as unforgiving as the women of Greeley's Saloon. When we both died we were unceremoniously dumped back at the beginning of the game. Not the level, not the world, the entire game. It was brutal. With each restart we were presented with a whole new layout. Have I mentioned that the levels are randomly generated? Because they are. Memorization would not help us here. We would simply have to get better. Which we did. Spend your money on items. You won't regret it. Unless you buy the Teleporter. Nuts to that. Co-op is an interesting animal in Spelunky. We were forced to share the same screen. Player one is marked with a little white flag, so the camera would follow me. If my wife was off screen for more than a few seconds a ten second timer would activate. When it hit zero, she would die. If she was still alive when I died, the flag would automatically attach to her character, allowing the camera to focus on her. This made for some frustrating moments, since there's no way to manually change the flag bearer. The dead player can continue to play as a ghost, which we thought was pretty useless, until we started blowing enemies. More on that later. 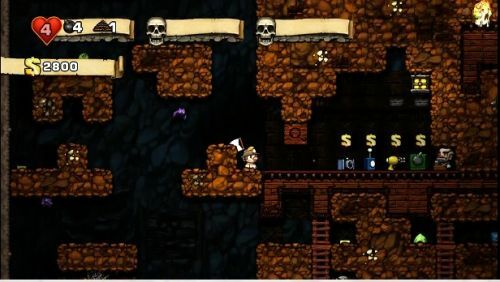 Spelunky often forces players into confined spaces. Stunning, and even damaging each other is almost inevitable. Communication is key, and timing jumps, falls, and bombs requires constant, patient communication. Players can blow each other up, hit each other with their whips, and even throw one another off ledges. If you are not Zen with your co-op partner, you are going to have a bad time. A real bad time.